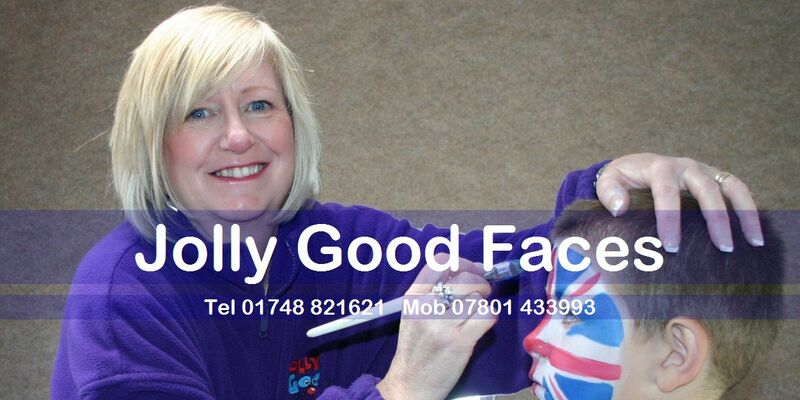 Welcome to Jolly Good Faces...home of fabulous face painting! 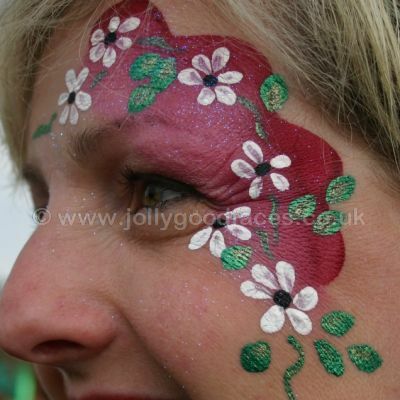 Face Painting for children and adults at events of all kinds and private parties too. 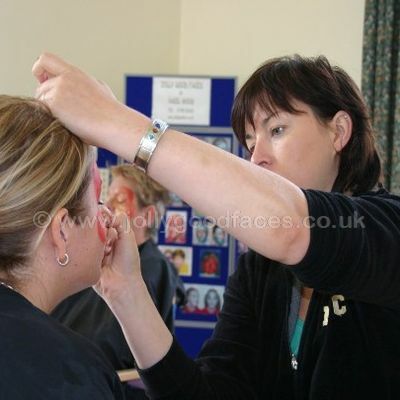 We also run face painting training courses. 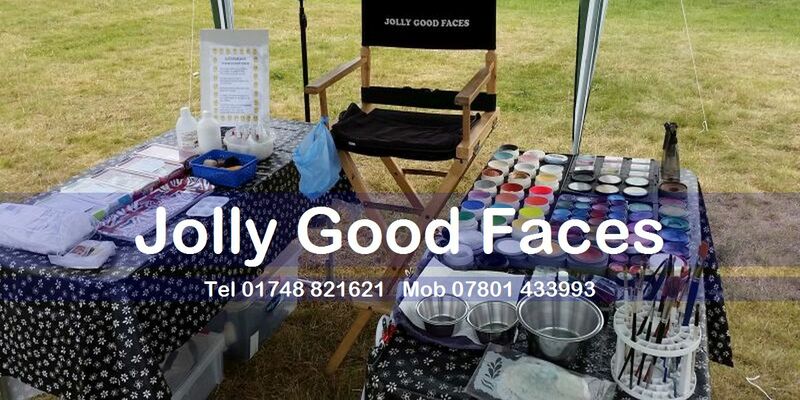 Jolly Good Faces can provide a Face Painter for a birthday party in the following areas: Richmond (Yorks), Catterick Garrison, Catterick, Bedale, Northallerton, Darlington, Reeth, Barnard Castle, Newton Aycliffe, Bishop Auckland, Middlesbrough, Stockton, Hartlepool areas. 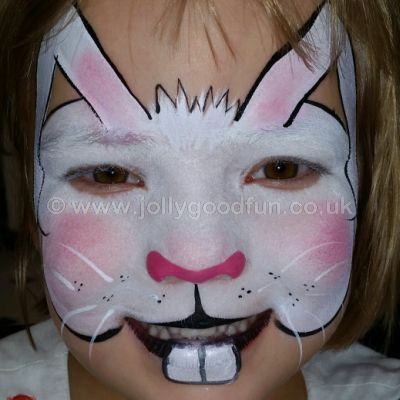 Prices from £90, two hour party, Richmond (Yorks) area. 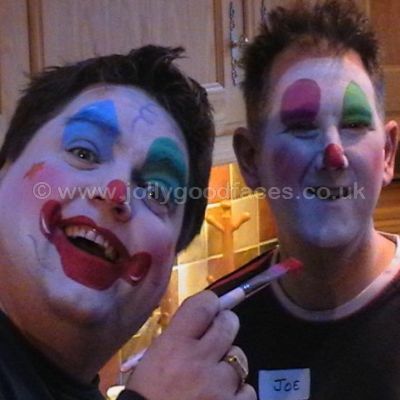 Prices from £160 for events in Yorkshire and the North East. Up to four hours. 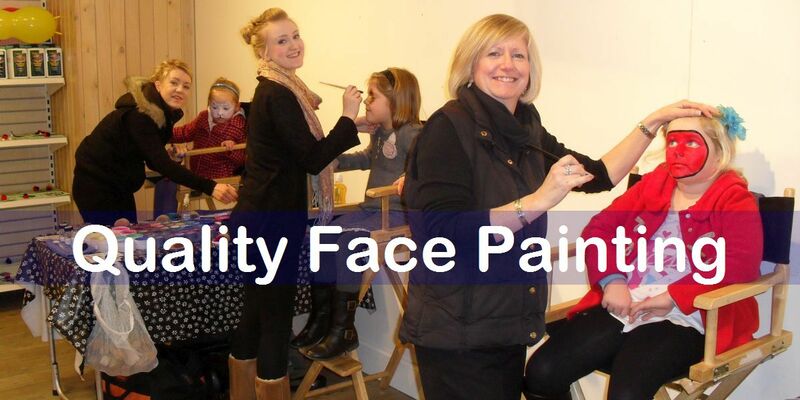 An early picture of Hazel (face painter)with daughter Natasha as her model. 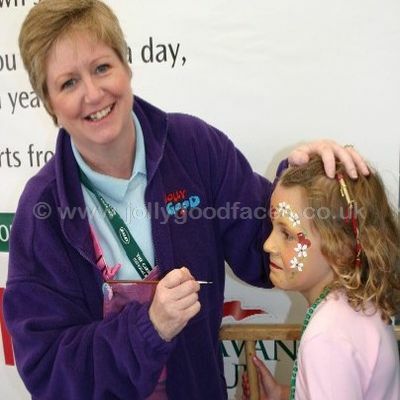 Face painter Hazel working for Green Flag at the National Caravan Rally. Face painter Hazel working for M&S at a store promotion. 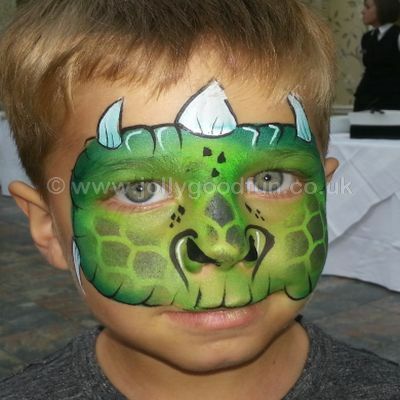 No Family Fun Day or Event would be complete without face painting.A good face painter can complete approximately ten faces per hour so larger events may need more face painters to meet demand. 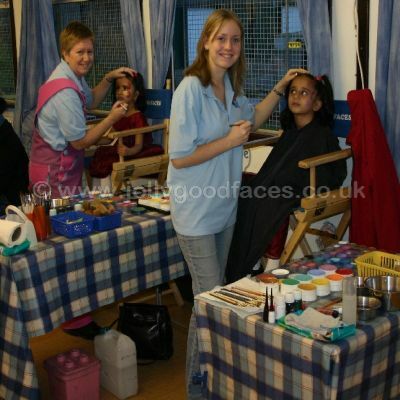 Children love to have their faces painted. Face painting brings extra fun to a birthday party too. 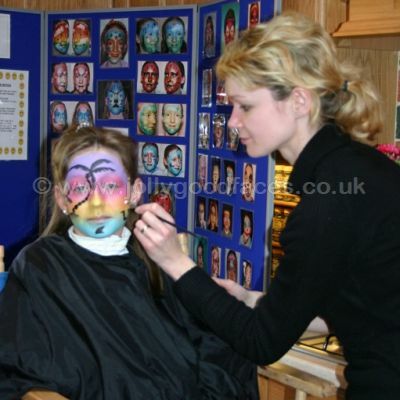 Children can have their faces painted one at a time whilst other entertainment is taking place. Purple Flower face by Hazel Wood. Rabbit Face by Hazel Wood. 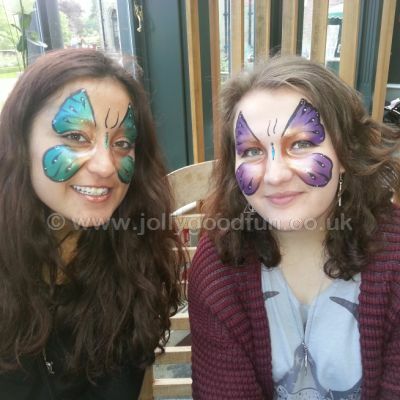 Face Painting is not just for children. 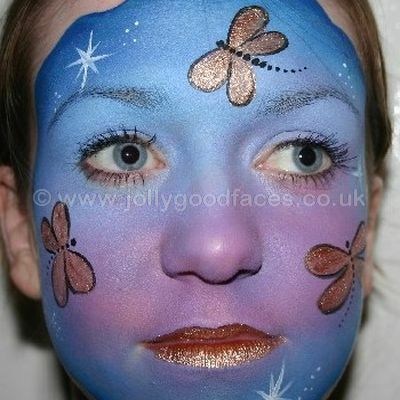 Adults find it great fun to have their faces painted at parties and events. 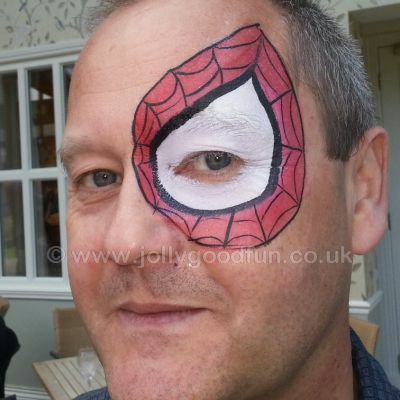 A face painter can add extra fun at a Wedding, Company party, BBQ, Ball, Student event, Halloween or Christmas party. 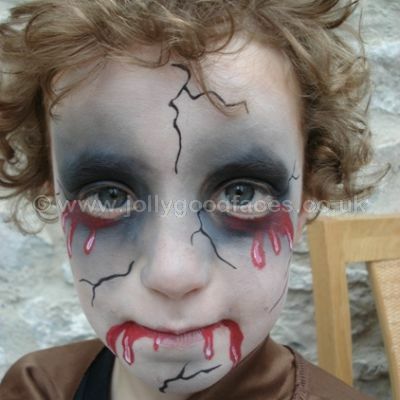 Hazel has many amazing face designs which look brilliant on adults. 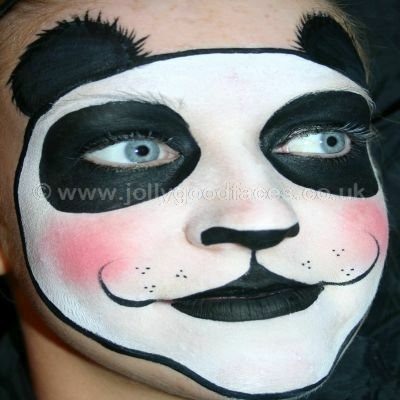 Those not wanting a full face can choose simple designs on their foreheads, cheeks or arms. 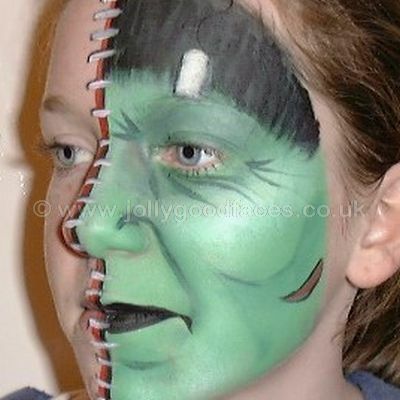 Half Frankenstein Face by Hazel. 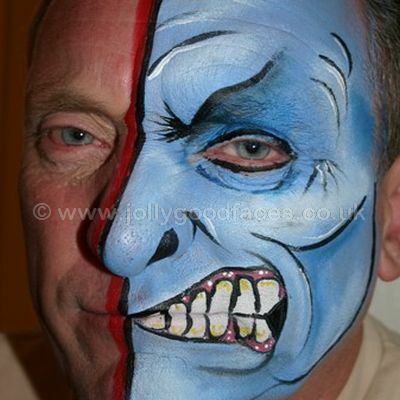 Half Man, Half Beast Face by Hazel. Flower Eye Design by Hazel. 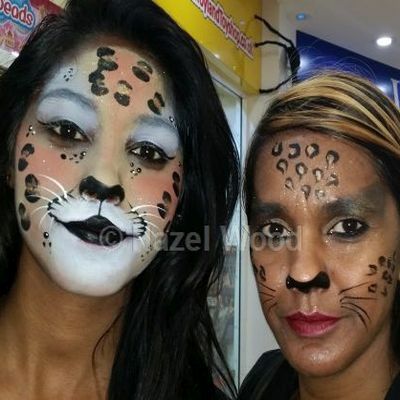 Leopard Faces by Hazel Wood. Spiderman Eye Design by Hazel. 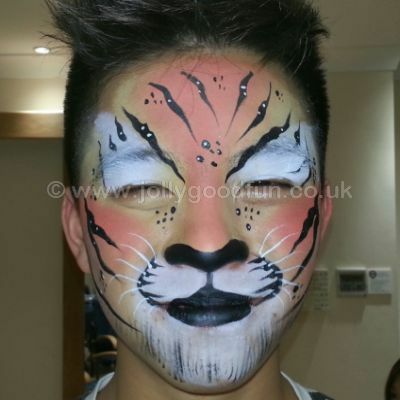 We offer an intensive two day training course for people who are seriously interested in learning everything there is to know about face painting professionally. 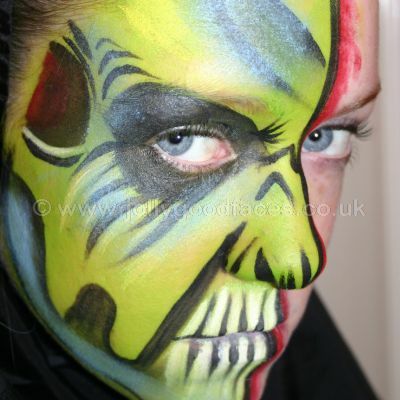 The course covers health and safety, hygiene, materials and equipment, brush strokes and blending, application of bases, use of colour, ageing and other useful techniques. 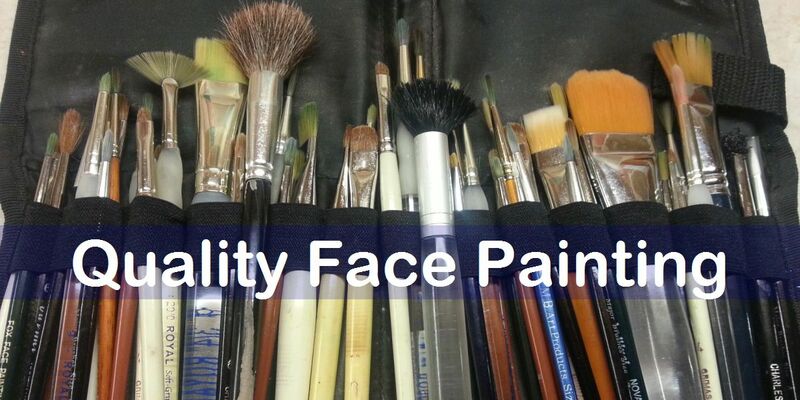 You will learn how to paint at least six standard faces from which you will be able to develop your own portfolio. Hand outs are provided on the topics covered and each student receives a contact list for suppliers and organisations. Each student also receives a certificate to show they have undertaken structured training from an experienced professional. Courses take place in Richmond, North Yorkshire and Bed and Breakfast is available locally for those travelling long distances. For one to one training, the student will need to bring a model to work on. Learning to use a brush properly. Hazel explaining an important point. Hazel demonstrating a technique on her arm. Lots of advice from Hazel. Building up a solid base of knowledge. Hazel keeps a close eye on progress. 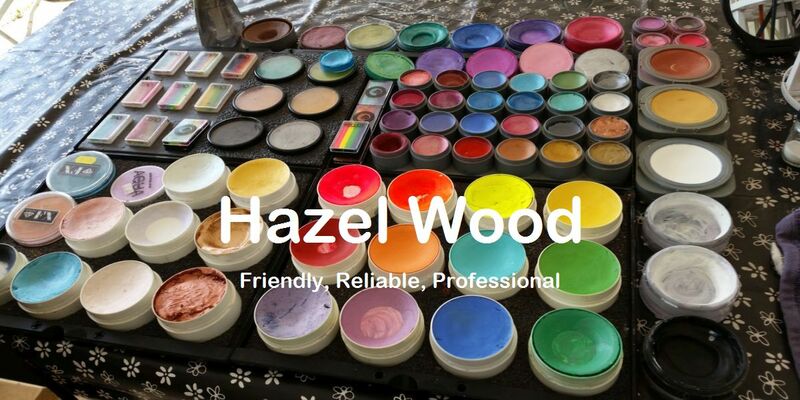 Hazel Wood is a highly experienced professional face painter who regularly travels to events throughout Yorkshire and the North East. Her expertise and the very high quality of her work is recognised by her clients and colleagues alike. Hazel set up Jolly Good Faces over twenty years ago. For larger events her daughters can sometimes assist. They are also talented face painters. 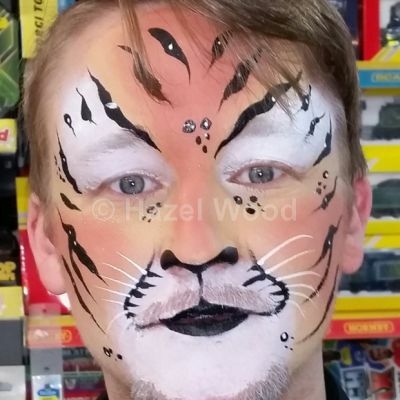 Hazel is a full time face painter who has developed an extensive range of superb faces to delight both children and adults. Hazel's friendly personality and capacity for hard work makes her an asset at any event. 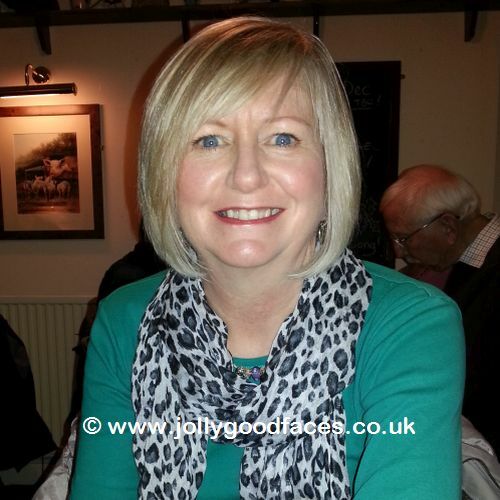 Hazel is also a partner in Jolly Good Productions and together with husband Ron can supply other forms of entertainment if required. When completing the form please type "none" in any fields that do not apply. Contact Form submit this form to request a price or information. © 2006-2019 Hazel Wood, Jolly Good Faces.